Windows from ABC Seamless stand apart from other home windows on the market. ABC Windows are made with virgin vinyl rather than recycled vinyl, which can become less durable during the recycling process and have a greater tendency to warp under exposure to UV rays. 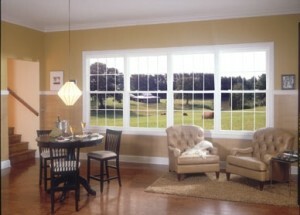 Virgin vinyl windows offer a level of strength and durability that recycled vinyl home windows simply can’t match. ABC Windows stand the test of time – and they’ll help you save money on your heating and cooling bills, too. Amazing energy-efficiency – Our ENERGY-STAR rated double- and triple-pane windows feature a specially coated glass that ensures optimal energy efficiency by drastically reducing heat loss through the window. This can help reduce your utility costs. Low-maintenance beauty – Our windows won’t chip, warp, or fade, and they will never need painting or scraping – just an occasional wash-down with soap and water will keep your windows looking beautiful for years to come. Customizable styles – We offer and install new construction windows and replacement windows in a vast array of styles to suit your home’s unique architectural personality. Window styles include double-hung, slider, bay, bow, awning, garden, and casement, among others, and can be customized with your choice of finishes, grids, and other options. An outstanding warranty – ABC Window offers one of the better window warranties in the industry – that even covers glass breakage! Contact us today for more information about our energy-efficient home windows or to learn about the other products we install, including seamless steel home siding and steel soffit and fascia. ABC Seamless has been a mainstay in the home improvement industry since our company’s founding in 1978. ABC Seamless got the work started early and I love my new windows.